3 Bedroom Semi Detached House For Sale in Mansfield for Asking Price £170,000. Frank Innes are pleased to welcome to the market this very well presented three bedroom semi detached family home. 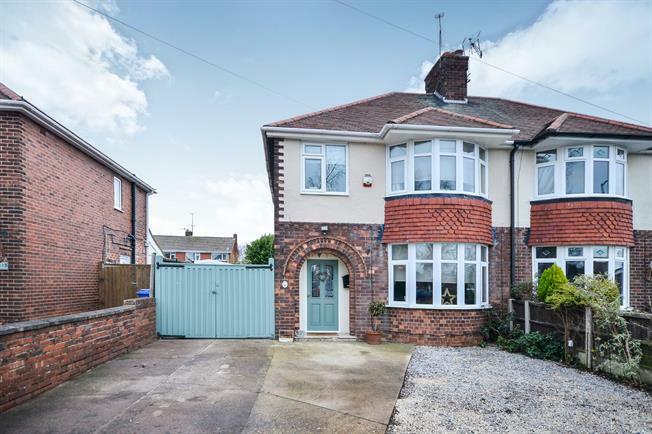 The property comprises of entrance hallway, double aspect lounge diner with bay window facing out to the front and patio doors opening to the rear enclosed garden, modern fitted kitchen with space for appliances and storage cupboard under the stairs. Leading upstairs initially is the master bedroom with fitted wardrobes and bay window, second double bedroom to the rear, modern fitted bathroom with white three piece suite and shower over the bath, third single bedroom which is currently being used as a study. The attic has been converted and can be used as luxury storage or a play room. Outside of the property is a rear enclosed garden with sheds to the bottom of the garden great for storage, single detached garage and driveway for a number of cars to the front.